Add The New Katzkin VIS To Your Website Today! to my leather loving friends. We are happy to announce that the Limited Edition design for the new model year F-150 is now available from DK and in stock ready to be shipped same day from our warehouses. The F-150 Limited Edition Design has a Lapis wrap with Black wrap, Black Combo, perforated inserts, and Silver contrast stitching. 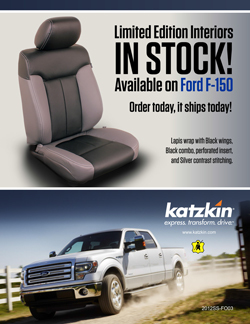 For you and your dealership’s convenience we have sell sheets available for the F-150. Call your sales rep or our marketing department to get your hands on these specially designed sell sheets for the F-150 Limited Edition Design from DK. The F-150 is a great complement to our currently existing line up of popular Limited Edition designs for Toyota Camry, Jeep Grand Cherokee, Hyundai Sonata, and Toyota Prius. All of these are available in DK and in stock at our warehouses, ready to be shipped to you. 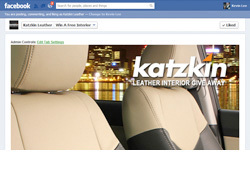 Don't Forget To Enter our facebook contest to win a Free Interior From Katzkin! So what’s new in the car business? You don’t have to look too far to find that answer – magazines, websites, cable TV, you name it. Personally, I’m a big fan of Autoblog. It tells you what’s new, balancing truth with gossip. If you read it regularly, you can find the latest emerging trends as they’re happening. One trend I find particularly interesting is how many “special editions” are coming out of the automakers. 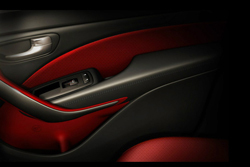 From Nissan to Ford to Audi, it seems everyone is doing what we at Katzkin do everyday – creating unique special editions for our customers. It reinforces the idea that some customers are just not happy with vanilla, even if their new car gets great gas mileage. Cars are passionate objects, evidenced by what you hear people saying about them. “I want that new Camaro!” “I hate that new (whatever)!” “I love how I feel when I’m in my car.” No one speaks that way about their kitchen appliances, do they? At least, I hope not. As a restyler, you can meet this trend head on. The Katzkin VIS continues to expand, offering easy-to-select designs that offer you choices going far beyond “vanilla.” We keep adding ready-to-order designs for all the 2013-2014 models, as well as many previous model years. So take a look if you haven’t in a while, go shopping there, and discover all the new ideas that will inspire you to express your own specific tastes and fulfill your customers’ desires.